Discover our new range of Pencils for eyes, lips and eyebrows. Find some intense and deep colors to highlight your eyes and contour of your lips. Experience an easy make-up with soft and tender lids. Eco certified formulas, respectful of your skin, specially dedicated for sensitive eyes and skin (suitable for contact lens wearers). Très bon achat. En taupe, pour le premier: mine grasse qui rend l'application très agréable. Bonne tenue de la couleur. J'ai été séduite et ai pris un noir: très foncé, très bonne tenue, on dirait un eye-liner. Top !! 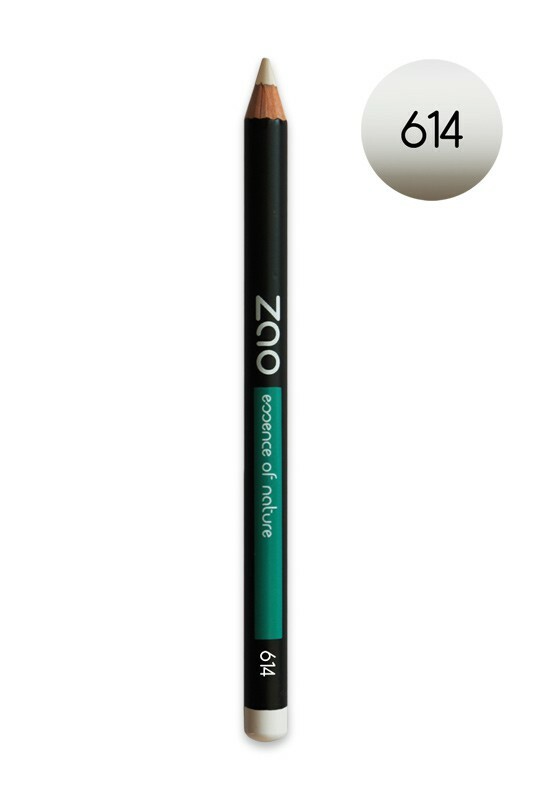 ZAO Pencil : a real multi-function for your makeup ! 1) The eye pencil is perfect to emphasize your look. To be applied at the edge of the eyelashes of each eyelid for an intense makeup. Draw a line of varying thickness starting from the outer corner. Blend a bit the line on the lower eyelid which needs to be less covered. Apply eye pencil before eye shadow to set the makeup. If you're tired, do not wear makeup on the lower eyelid, which would accentuate dark circles. For a perfect "doe eye" effect, trace the outline of your eye while going up, accentuating the outside line. 2) The lip liner allows you to draw your lips and is best used in conjunction with a ZAO lipstick or gloss. It extends ideally lipstick holding and prevents it from spinning. Feel free to powder with ZAO mineral silk or compact powder to fix the line. Draw the outline of the lips before applying the red or gloss. Start with the "V" of the upper lip and the middle of the lower lip. Then go up from the corners of the lips to connect the points. 3) The eyebrow pencil makes your look more intense. Brush eyebrows up and down and redraw them using the natural course of hairs. Directed down, they give a certain "languishing" to your look, at the opposite directed up, the look becomes more "chic“. Feel free to powder with ZAO mineral silk or compact powder to fix the line. If your face is oval, choose the eyebrows with natural curves. For round faces, increase the angle to "break" the roundness. If your face is long, choose long and slightly accented eyebrows. Finally, if your face is square, make sure you set a "soft" curve to soften facial features. 601 black shade : CI 77499, HYDROGENATED JOJOBA OIL, CAPRYLIC/CAPRIC TRIGLYCERIDE, HYDROGENATED VEGETABLE OIL, SIMMONDSIA CHINENSIS SEED OIL*, BUTYROSPERMUM PARKII BUTTER*, CANOLA OIL, SCLEROCARYA BIRREA SEED OIL, CANDELILLA CERA, MICA, COPERNICIA CERIFERA CERA, GLYCERYL CAPRYLATE, TOCOPHEROL, HELIANTHUS ANNUUS SEED OIL, ASCORBYL PALMITATE. Others shades : HYDROGENATED JOJOBA OIL, CAPRYLIC/CAPRIC TRIGLYCERIDE, HYDROGENATED VEGETABLE OIL, SIMMONDSIA CHINENSIS SEED OIL*, BUTYROSPERMUM PARKII BUTTER*, CANOLA OIL, SCLEROCARYA BIRREA SEED OIL, CANDELILLA CERA, GLYCERYL CAPRYLATE, COPERNICIA CERIFERA CERA, TOCOPHEROL, HELIANTHUS ANNUUS SEED OIL, ASCORBYL PALMITATE MAY CONTAIN (+/-) MICA, TALC, SILICA, CI 77007, CI 77891, CI 77492, CI 77510, CI 77499, CI 77491, CI 77742. J'ai commandé le crayon blanc pour souligner le contour de l'oeil pour l'éclaircir.Facile à utiliser et pas de réaction allergique! Ca me convient! Trés bon produit. La couleur (cuivre pour ma part) est très pigmentée. Je l'utilise par dessus un baume pas trop gras pour faciliter sa pose et il ne filoche pas , je ne porte plus que lui ! Très déçue. J'ai acheté le crayon couleur taupe. Ne s'applique pas vraiment facilement et n'a aucune tenue. Trop cher au vu de sa qualité. Très bon produit qui répond à beaucoup d'exigences : végane, écocertifié, sans aluminium, couleur intense... Se maquiller redevient un plaisir !